For its first residential project in the U.S., the Swiss architectural-design firm Herzog & de Meuron embraced the local culture. 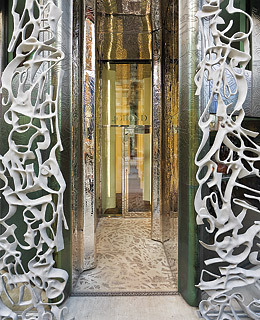 Witness the graffiti-inspired walls and ceilings in the elevators and lobby, and the similar 22-ft.-high (6.7 m high) sculptural gate spanning the length of the building. The boxy exterior made of Spanish glass and blackened copper doesn't betray any sense of the curved forms within, but the floor-to-ceiling windows can't conceal an emphasis on light and outdoor spaces. Developed by Ian Schrager, the building is nothing if not modern Manhattan.